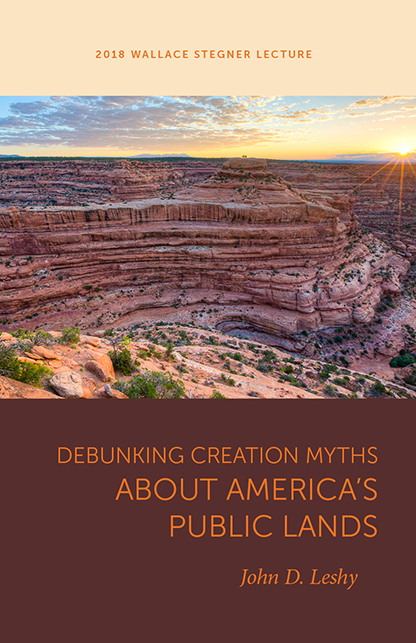 In recent times several “creation myths” have gained currency about how the United States government came to own and manage—for broad, mostly protective purposes—nearly one-third of the nation’s land. Controversies such as President Trump’s shrinking the boundaries of Grand Staircase–Escalante and Bears Ears National Monuments and the armed takeover of the Malheur National Wildlife Refuge in Oregon by a ragtag militia group protesting U.S. ownership have brought these myths to the forefront, suggesting that public lands are a kind of centrifugal force driving Americans apart. Over the nation’s long history, however, the opposite has nearly always been the case. In this essay, John Leshy debunks the myths that have contributed to the often polarized character of contemporary discussions of public lands. Recounting numerous episodes throughout American history, he demonstrates how public lands have generally served to unify the country, not divide it. Steps to safeguard these lands for all to enjoy have almost always enjoyed wide, deep, bipartisan support. Leshy argues that America’s vast public lands are priceless assets, a huge success story, and a credit to the workings of our national government. But because these lands remain fully subject to the political process, each generation of Americans must effectively decide upon their future. John D. Leshy is Distinguished Professor Emeritus at the University of California, Hastings College of Law in San Francisco. Before joining the Hastings faculty in 2001, he served as solicitor (general counsel) of the Interior Department throughout the Clinton Administration, special counsel to the House Natural Resources Committee, professor at Arizona State University College of Law, Associate Solicitor of Interior, with the Natural Resources Defense Council, and the Civil Rights Division of the U.S. Department of Justice. Leshy has published widely on public lands, water, and other natural resource issues, as well as on constitutional law and legal history. He has four times been a visiting professor at Harvard Law School, from which he graduated after earning an A.B. from Harvard College.